Have you ever heard of snow blindness? Did you know that you can have sunburned eyes? This unique condition, also known as photokeratitis, can happen with or without the presence of snow. Our eyes are delicate organs that need protection from ultraviolet (UV) light, despite the environmental conditions. Snow blindness is caused by a sunburned cornea. It is often seen with skiers, snowboarders, and mountain climbers due to their close proximity to the sun’s harmful rays. Can snow blindness be permanent? We will answer this question as we discover the causes, symptoms, and prevention tips for snow blindness. The snow blindness definition refers to any impairment of vision due to UV radiation from either the sun or artificial light. The name photokeratitis comes from photo, meaning light, and keratitis, meaning cornea inflammation. This is a temporary but painful condition. Various snow blindness causes all lead to ultraviolet radiation, a form of electromagnetic radiation that transfers energy through waves. The sun is the primary source of UV rays, although man-made lamps can also produce them. Direct sunlight is a major cause of photokeratitis, as is the reflection of sunlight off of snow, ice, sand, and water. Snow alone can reflect up to 80% of the sun’s ultraviolet light. Common cases of snow blindness are frequently seen during the spring season. Hospital emergency rooms experience an increase in patients with eye issues during a solar eclipse, from staring directly at the sun. Although we are taught since grade school not to gaze at a solar eclipse with the naked eye, it is a common eye injury. This action can also cause the retina to burn, which is a more serious eye trauma that can last for a longer time than snow blindness. Most cases are related to sunlight exposure, but snow blindness can also happen with sunlamps, tanning booths, and other unnatural sources such as a welder’s torch, also known as flash burn. Many industrial accidents result in photokeratitis due to improper eyewear protection. In less common cases, snow blindness may result from the surface of the cornea becoming extremely dry or frozen from the air temperatures and conditions. These symptoms can be present with any prolonged exposure to UV light. In addition to snow blindness, more serious conditions can develop such as eye cancers, eyelid cancers, macular degeneration, cataracts, or a tissue growth known as pterygium. When it comes to the photokeratitis condition, your lifestyle plays a big part. It is extremely important to protect the eyes with sunglasses and other shielding eyewear. Snow sports enthusiasts, water lovers, beachgoers, and users of welding tools each have a high risk for snow blindness. The environment in which you live or play is also a factor in the risk for photokeratitis. High altitudes such as the mountain ranges can be a risk factor, as the air in these areas is much thinner. This allows for stronger UV light from the sun. Regions with snow and ice also raise your risk, as the light reflects on these surfaces. This is evident in the North Pole and South Pole regions of the world. The normal color of the eye is seen on the iris. Common eye colors are brown, blue, amber, hazel, gray, green, and red (typically seen in cases of albinism). If you have light-colored eyes, you are at a higher risk for snow blindness as well as other eye disorders such as melanoma. Stay out of all forms of sunlight. Wear protective eyewear when in direct sunlight and indoors. Remove contact lenses and avoid use until the eyes heal. Moisten eyes with preservative-free artificial tears. Lie down with a cold, damp facecloth on the eyes. You can also try using gauze to create two eye pads with a one-half inch thickness. Place on the eyes to block light and avoid further damage from the movement of eyelids. 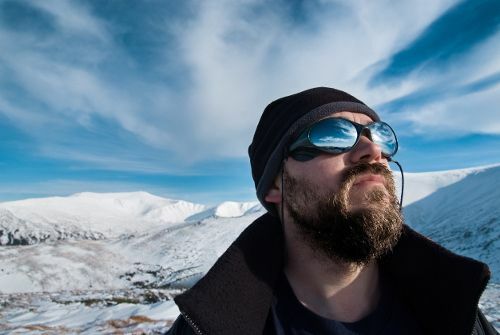 You can protect yourself and your eyes from snow blindness by simply taking a few easy steps when living, working, and playing in ultraviolet light and high-risk regions. Use sunglasses with 100% UV light protection. The best eyewear will be polarized and tagged with UV400. The darkest ones are not always the best, as both UV-A and UV-B radiation need to be blocked. Wear sunglasses year-round outside, whether it is sunny or cloudy. Despite the common myth that clouds block the damaging ultraviolet light, the harmful rays can stream through the clouds. Protection is especially necessary whenever you are in snowy or frigid regions. Use sunglasses when walking, shoveling snow, skiing, snowboarding, and sledding. Wear hats with either a wide brim or full peak to shade the eyes. Always use all recommended safety equipment and follow safety procedures when operating machinery and equipment that produces powerful light. For contact lens users, double up on your eye protection by choosing lenses that block ultraviolet light as well as wearing sunglasses. Outdoor sports enthusiasts should invest in eyewear with a rubber overhang above the eyes and side guards to block sunlight. Many sports sunglasses and sports goggles have a wrap-around design for such protection. For those playing or working in snowy conditions, there are glacier goggles that protect against harsh weather conditions of high winds and blizzards. Similarly to sports goggles, glacier goggles have lenses that are dark, mirrored, and polarized. If you lose your snow goggles or specialized sunglasses on the slopes or mountains, you can make a temporary pair by using duct tape. Fold a piece of duct tape together and cut two slits for eye holes and fasten to head or helmet with more tape. The medical condition snow blindness can be scary when it happens, especially with extreme blurred vision. It is a temporary condition that usually disappears on its own within a day or two. This is why treatment focuses on the common symptoms of eye pain, headache, and light sensitivity with rest and avoiding the light. Also referred to as photokeratitis, it is caused by the damaging rays of the sun and other sources of ultraviolet light. You can prevent snow blindness by wearing protective eyewear when exposed to sunlight, light reflective surfaces, and artificial lighting. Thompson, S., “How To Deal With Snow Blindness (Photokeratitis),” Eye Health Web; http://www.eyehealthweb.com/snow-blindness/, last accessed August 10, 2017. Heiting, G.,“Snow Blindness: How To Prevent Sunburned Eyes,” All About Vision; http://www.allaboutvision.com/conditions/snowblind.htm, last accessed August 10, 2017. Porter, D., “What Is Photokeratitis – Including Snow Blindness?” American Academy of Ophthalmology, September 1, 2016; https://www.aao.org/eye-health/diseases/photokeratitis-snow-blindness, last accessed August 10, 2017. Macnamara, T.., “Prevention, Symptoms, And Treatment for Snow Blindness,” ThoughtCo., March 23, 2017; https://www.thoughtco.com/snow-blindness-prevention-3157485, last accessed August 10, 2017. “How To Treat Snow Blindness,” Backpacker, March 31, 2005; https://www.backpacker.com/skills/the-cure-treating-snow-blindness, last accessed August 10, 2017. “Ultraviolet Radiation,” CCOHS; https://www.ccohs.ca/oshanswers/phys_agents/ultravioletradiation.html, last accessed August 10, 2017.